Welcome to my blog. I document our family's adventures in Andalusia, Spain, and travels across Europe. Hope you have a nice stay! Much like our time remaining in Spain, I really need to hurry to wrap up the details of our trip to Portugal back in December. After a memorable detour to Monsaraz, we headed to Sintra. This would be one of our only repeat trips, as we felt that our time in this magical city was cut too short on a day trip from Lisbon in 2017. We stayed in Casa da Pendôa, which I highly recommend. The location is right in the heart of Sintra, the apartments were so spacious, and the price was more than reasonable. Fresh bread is even hanging from our door when you wake every morning! The main objective of our full day in Sintra was Quinta da Regaleira. While there is a large twentieth century residence on the site, the magical gardens are the true gem. There is a secret Initiation Well, hidden tunnels, stepping stones – magic around every corner. After a couple of hours of exploring, we truly enjoyed our lunch at the onsite café. We then made the quick walk back to the center of town where we took turns supervising the kids at the playground. I took a quick turn around the shops in town, and then Charlotte and Dennis took in the National Palace of Sintra. They said they were the only ones in the place, and they were pleasantly impressed with this palace right in the center of Historic Sintra. The view from the bottom of the Initiation Well. We all made it across these stepping stones, which was the highlight of the park for us. 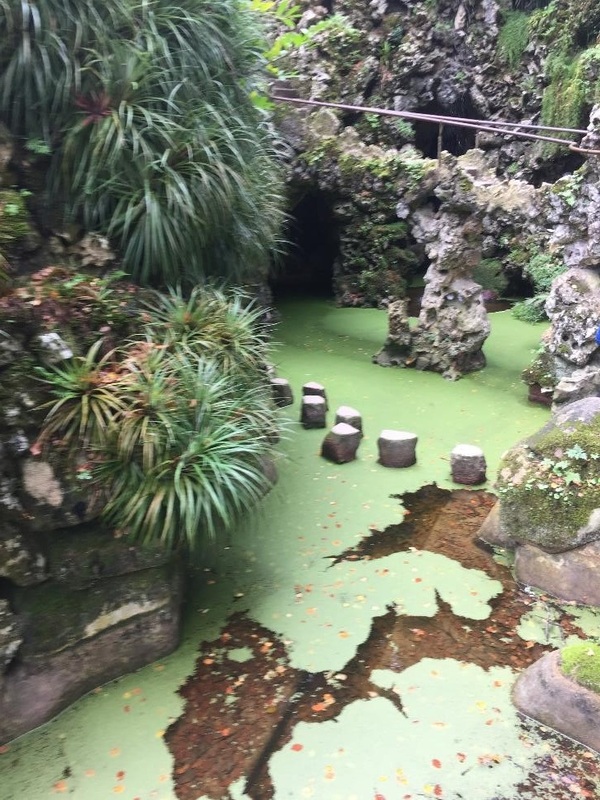 As a parent, exploring places like Quinta da Regaleira, I hope that the experience enriches the imaginations of our little travelers. I hope these magical places - tucked in forests or in the hearts of cities - inspire them to tell rich stories and search for even more magic. Because even I was enchanted and inspired in these moss covered caves and forest paths. After a full day, we headed back for baths and bed as our kids were remarkably worn out. We failed at eating any exciting meals. Off season hours and siesta worked against us and we ate pizza and Indian food from the Indian-Italian fusion place right by our hotel…two nights in a row. We did enjoy many of Sintra’s pastries though, so that was a win. I always have pinch me moments when we are able to make a repeat visit to a place. We visited this ice cream shop the last time we were in Sintra. The following morning we checked out of our hotel bright and early before the kids could start day two of running races through the apartment at 6:00 a.m. Our first destination was Fatima, about 1.5 hours north. This stop felt rushed and stressed, exactly what I didn’t want it to be. But it was far more meaningful and awe-inspiring than I expected. Just the scale alone was more than I expected. I often feel my own faith, but in Fatima, it was as if I could feel the faith of many, pulsing through this place. And it was remarkable. I would have loved to have slowly taken the rosary walk from the Shrine to the homes of the shepherd children, and perhaps I will some day. But we did drive the home of Jacinta and Francisco. And it struck me. About an hour away from this place are the many, many palaces and castles of kings, yet Mary did not choose to appear to them. She appeared to these humble shepherd children in rural Portugal. And she used these simple children of faith to help bring change to this world. 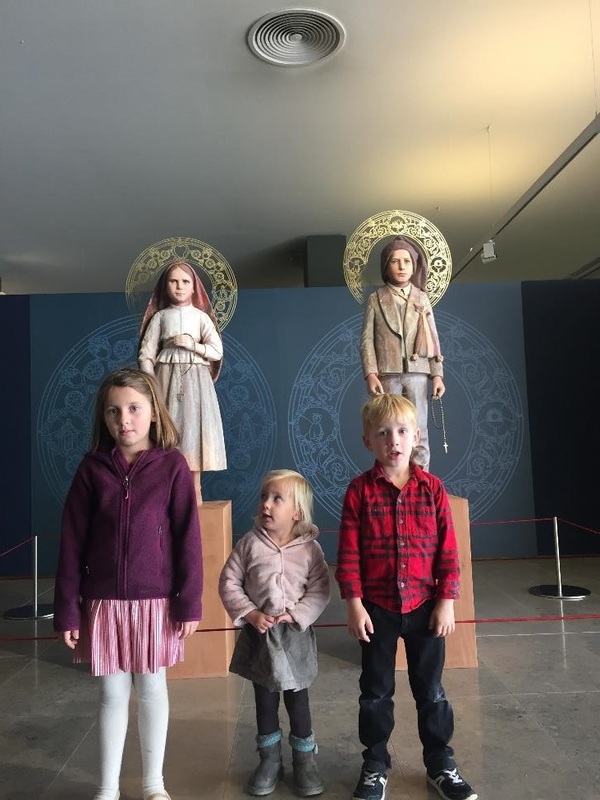 How do you pose in a holy place like Fatima? Just like mass, this stop was a bit trying with our preschoolers. But their faith is big and real and they are learning. We all just keep on trying.